The future site of Sue's Circle, the memorial garden in honor of former Associate Conference Minister Susan Dickerman. Trees were removed from the site on June 26 - the first step in preparing the space for the garden. 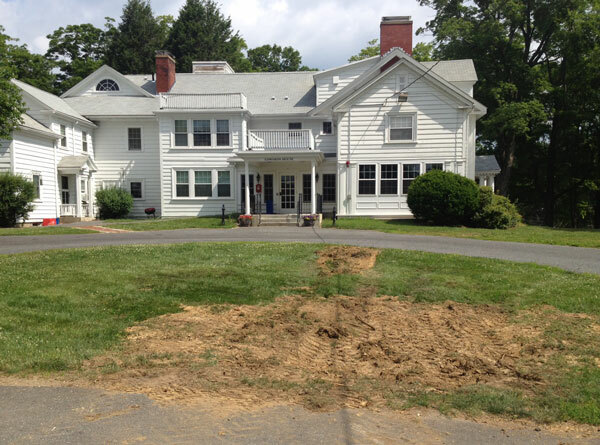 Work has begun to prepare the site for Sue's Circle, a memorial garden to honor the ministry of the late Susan Dickerman, but more donations are needed to bring the garden to life. The garden will be located on the Massachusetts Conference's Framingham property, between the main office and the Edwards House Meeting & Retreat Center As originally designed, the garden would cost $15,000. Approximately $7,250 in donations has been received and another $2,500 will be taken from the Conference's capital budget toward the project. With those funds in hand, preparation for the garden installation began today with the removal of trees. More foundational work will be done later this summer, such as grading, the installation of topsoil and some initial plantings. Further work will be done as funds become available. Suggested donations toward the project range from $10 for a perennial to $400 for a bench. Donations can be made online here, or checks may be marked Sue's Circle, made out to MACUCC and sent to 1 Badger Road, Framingham, MA 01702. Susan Dickerman passed away in February after serving on the Massachusetts Conference staff for 26 years. She had left the Conference in December for a calling as co-director of the new, nationwide Pastoral Excellence Network. She had only begun that work when she was overcome by a return of the cancer she had defeated several years earlier. Download a PDF showing the detailed garden plan.